Authorities in China are racing to unscramble the world's longest traffic jam, a 60-mile tailback stretching from the capital Beijing to the northern province of Inner Mongolia. 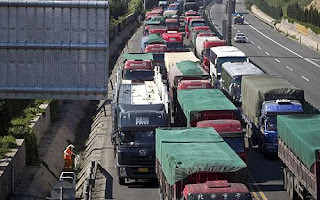 The jam on the main north-south motorway into Beijing has been blamed on a set of roadworks that is intended to alleviate congestion caused by thousands of trucks bring coal and perishable goods into the city. At its farthest extent trucks joining the back of queue in Inner Mongolia were taking several days to reach their destination, crawling along at about 2mp/d – or miles per day, the measure of speed on the clogged section. Little wonder the Chinese are so heavily committed to massively expanding their rail networks.